155 Mil (or 45.9% of all netizens) use their mobile devices to go online. 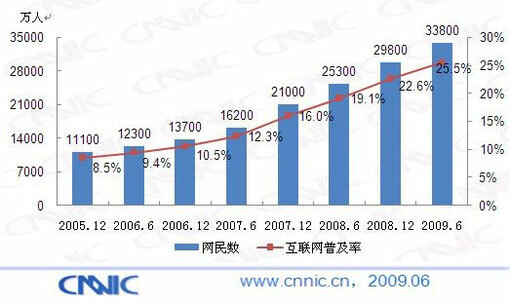 In the first half of 2009 this number increased by 37 Mil. 28% of these Mobile Internet Users are considering to use 3G in the second half of 2009. The majority of Internet users with over 60% are still in the age group of 10-29 although users between 30-49 are slowly catching up. 31.7% of Chinese Internet users are students. 81.5% of all users earn less than 450 USD/month. 23.5% even earn no more than 75 USD/months. The report also touches some ethical implications of the rapid Internet growth in China. While people in general believe the Internet broadens their horizon (90%), allows them to save time (81.6%) and facilitates information sharing (78.5%), the report also points out that 1 out of 6 Users has the tendency to become an Internet addict. 77.5% believe their life is invariably linked to the Internet. The average hours per Internet users spent online per week has for example risen from 16 to 18 hours in the last 6 months. Interesting to note is also that 84.3% of all Internet users consider the Internet the most important and most trustworthy source of information. Also check out Sinotechs post on this, which links to some additional interesting ressources.